The Bank of Maldives has appointed Fareeha Shareef as the first female chairperson of the national bank. The bank’s board of directors decided to appoint Fareeha at a meeting on Thursday. The post had been vacant since last year. According to the bank, Fareeha is a founder and former managing partner (2010 to 2014) of FJS Associates LLP where she currently holds the position of senior partner. “She is also a director at FJS Consulting Pvt Ltd and has been an independent consultant of Adam Smith International since 2012,” the bank said in a press release. “Ms Fareeha has professional experience in various fields such as auditing, accountancy, financial management and governance. In addition, she has vast experience in financial modelling, including banking, Micro Small and Medium Enterprises (MSME) and socioeconomic research in Maldives and in the international arena,” the press release continued. While political games and religious debates preoccupy media and coffee talk, civil sector projects persist in providing for the public. But they are subject to suspicion, and often slip under the radar. Recently, ARC organised an exhibition of children’s artwork from the shelters Education and Training Centre for Children (ETCC) on Maafushi and the Correctional Training Centre for Children (CTCC) on Feydhoofinolhu. In spite of promotions, the religious protests of December 23 and their aftermath coincided with the exhibition and more or less wiped it into the background. ARC was founded in 2009 to bolster the work of ETCC, CTCC and the shelter at Kudakudhinge Hiya. Although the shelters address different groups of children with different needs, they share the same basic interest – improve children’s lives. However, as Zaki experienced with the media, the shelters were struggling to forge a productive network. Yet Zaki, who volunteered at the shelters after returning from school in New Zealand, said short staffing and minimal funding made it difficult for the shelters to organised events individually. By creating a separate NGO specifically aimed at connecting the members of the child’s rights sector, she believed the stress on individual shelters could be reduced and progress could be achieved. The Ministry of Health and Family works closely with the relevant NGOs, and is trying to build a partnership with the corporate sector. According to Afiya, the ministry has signed Memorandums of Understanding (MoU) with NGO Maldives Red Crescent and corporate group Aima. “But there still needs to be a mechanism for NGOs and the government to form a partnership. We have to create funding opportunities and better articulate ways to achieve our goals,” she said. Validating Zaki’s instinct that most groups concerned with child and family matters share similar goals, Afiya said the government relies on NGOs for help jump-starting programs in society. However, the relationship between the government and the civil sector is still on the drafting table. And it may be drafting a few too many organisations. 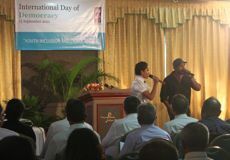 At the 2011 UN International Democracy Day ceremony, FJS Consulting Pvt. Ltd. highlighted key operational issues facing the Maldives’ civil sector in a “Comprehensive Study on Maldivian Civil Society”. Over 1100 Civil Society Organisations (CSO) and NGOs are registered in the Maldives–almost one organisation for every 300 people. CSO’s average employee is age 25, with an education level ranging from grade 6 through 10. Only 0.7 percent of employees are paid due to a funding shortage – donors provide the least amount of funding, and most CSO fundraising efforts only cover about 30 percent of program costs. Tracking funds and goals accomplished is difficult. “The government is trying to provide aid but the structure of how to do it is not specified,” said Managing Director Fareeha Shareef at the event, noting that many CSOs don’t actually engage in the activities for which they are named, such as sports. Speaking today with Minivan News, Shareef agreed that the high number of organisations is not supported by adequate funds and resources, but added that lack of awareness and communication are key problems. Unfortunately, the Maldives ranks highly for corruption and corruption perception. Zaki noted that there is a general public suspicion that NGOs request funding without a clear action plan, and that the money disappears unaccountably. She said this was one reason why ARC did not request funding for the first two years of operation. “2012 will be the first year for fundraising at ARC,” she said, pointing out that “we didn’t want to request money without being able to prove that it would go to good use. Working late into the night after her day job at the Foreign Ministry, Zaki called on friends to act in educational videos and help with design and advertising. Although ARC has many members Zaki said it is difficult to find active volunteers. Unable to find a local nutritionist for the HEAL campaign, she coaxed a friend from New Zealand with expertise in the field to take a volunteer work-based vacation in the Maldives. Pointing to the 0.7 percent of paid NGO employees, Shareef said the high number of youth volunteers in the civil sector is encouraging–but it is also a major concern. “Almost the entire sector is young and working on a voluntary basis. This means that there is a high turnover–young people need to get paid to get by, and so they move into the paid industries,” she said. When asked whether ARC was the first in its field, Zaki said she could not say which other NGOs were addressing children’s rights. According to FJS’ findings, children and youth are supported by less than 20 percent of NGOs. Approximately one-fifth of NGOs promote healthy living, empower vulnerable groups, or provide support for education. Over 50 percent focus on sports, music, arts and leisure. Operating solo in the civil sector, ARC provides direct support to the shelters while also expanding their reach to donors and the larger community. In 2011, ARC campaigned for Healthy Eating and Lifestyle (HEAL), Internet safety, prevention of child abuse, and road safety. Zaki said the campaigns reached parents as well as children. ARC also organised sports activities, including a month-long swimming program with Maldives National Defence Force (MNDF), and childcare trainings with Nurses of Maldives. Volunteers help teach children certain life skills which can benefit them personally and financially. “You teach a child to bake a cake, and that child can also go and work in a bakery,” Zaki explained. In spite of the difficulties, Zaki said she is pleased with ARC’s progress and is particularly glad to see first hand that donations are being properly invested by the shelters.